Are you a clusters person? You know, the gal/guy who picks out the crunchy clusters from bags of granola or boxes of cereal? 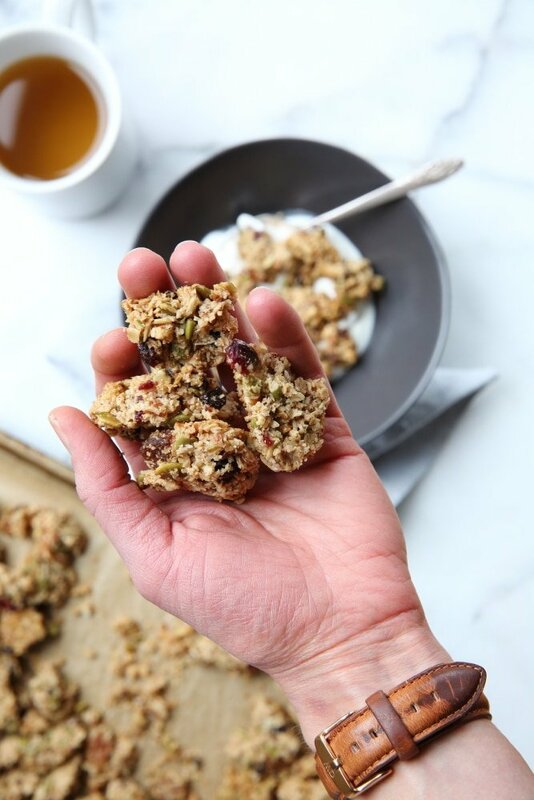 If your hand is raised like mine, then this granola clusters recipe is for you (new video below)! I apologize to James and anybody else who has gone to pour a bowl of granola at our house, only to find a rabble of crumbly oats and broken nuts. I’m a clusters picker. There, I admit it. 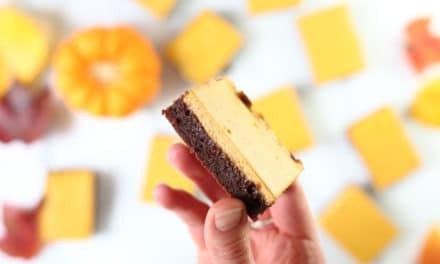 They’re one of my favorite snacks, and I’ve been caught red-handed more than once huddled inside the door to our pantry with a jar of granola, pilfering the oaty chunks. When I realized that the habit was getting out of hand, I decided to develop a granola recipe that was all about the clusters. Cue the orchestra people, because now you can have allllllllll the clusters. 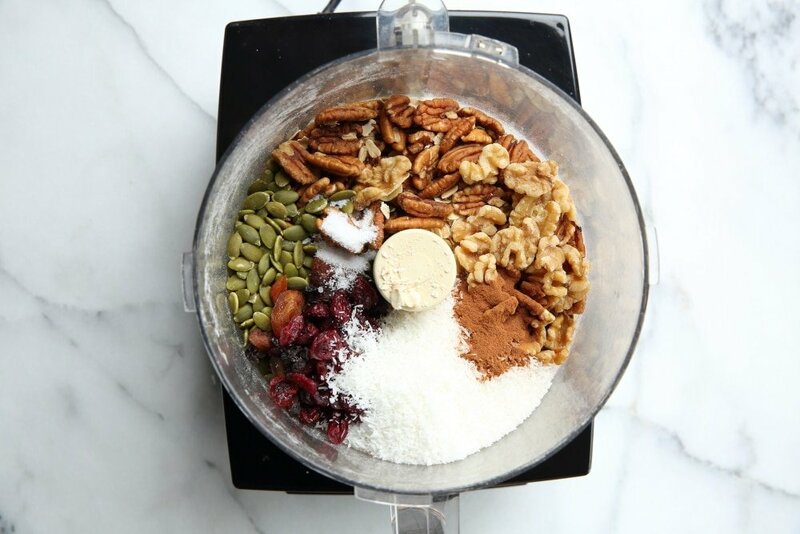 How do you make Granola Clusters? 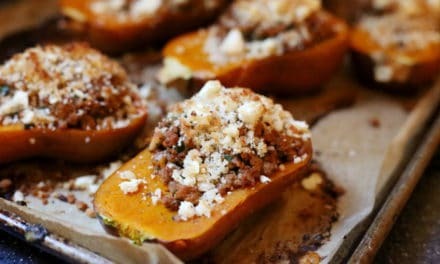 I originally created this recipe while writing my first book, The Food Processor Family Cookbook. 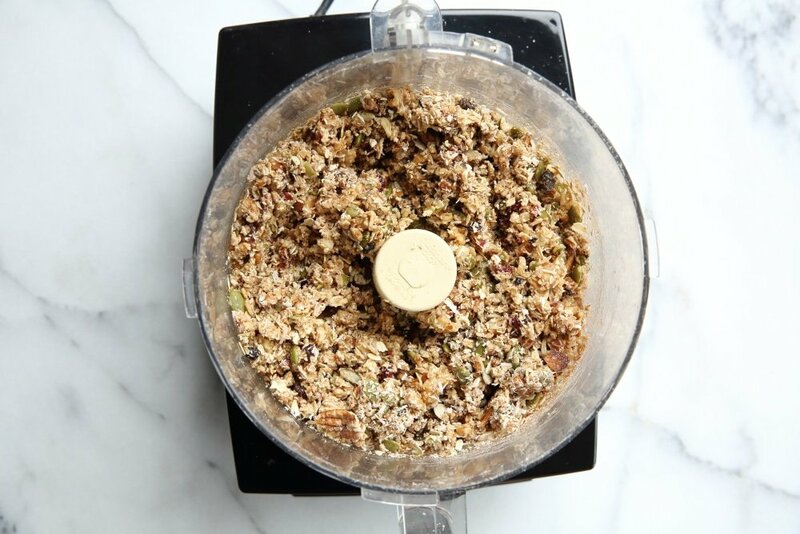 I decided to experiment with making granola in the food processor and discovered that not only does the food processor make the process super simple, but better yet, it creates beautiful, crispy chunks without the need for additional binders such as egg whites or starches! 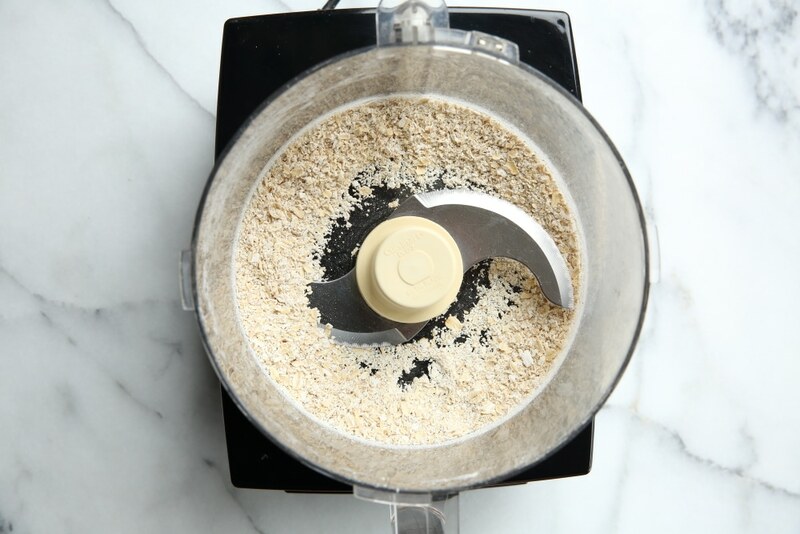 First, you grind up some rolled oats in the food processor to make a coarse flour. This step is key, as the flour will act like a binder, gently hugging all of the ingredients together. Next, you add the whole oats, nuts, dried fruit and seasonings (in this case cinnamon and coconut), which get pulsed together. Finally, you drizzle in the wet ingredients (maple syrup or honey, melted coconut oil and vanilla) and pulse again until everything is evenly incorporated and damp. 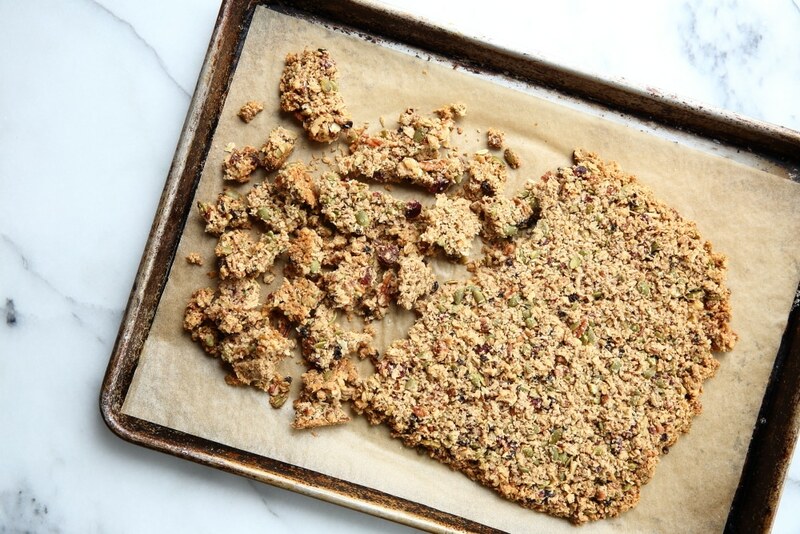 Spread the granola mixture onto a parchment-lined baking sheet and press it into a compact, even rectangle. This is another key step, as it will help the ingredients to stick together. Now the granola gets baked without stirring until golden. 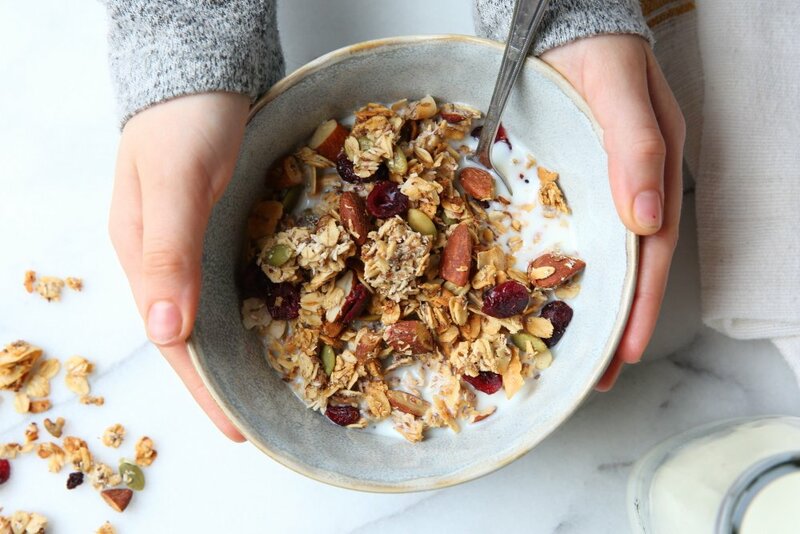 Once cooled, the granola bark breaks into lovely clusters that you can eat over yogurt or with milk for breakfast, or nosh them straight out of hand as a healthy snack or dessert. If you have a gluten allergy, be sure to by certified gluten-free oats. You’ll need a food processor for this recipe. I use this 14-cup Cuisinart model, which is a true workhorse in the kitchen. The granola gets backed on a parchment-lined baking sheet. These pre-cut parchment paper sheets will change your life. I store mine on top of my fridge. Be sure to press the granola into a compact rectangle before baking—it should be about 8×12-inches and 1/2-inch thick. 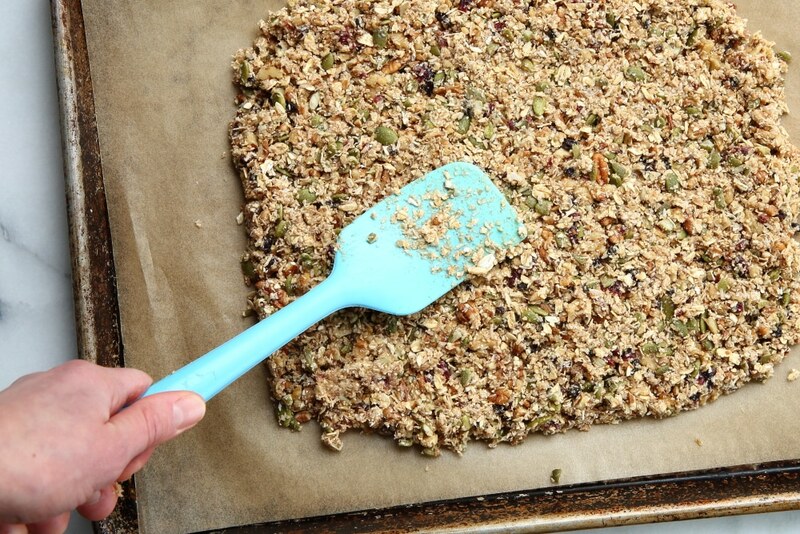 A silicone spatula works well for pressing the granola. Don’t stir the granola while baking! Be sure to let it cool before breaking it up. Store the granola in an airtight container, such as one of these pretty glass canisters. We eat this coconut flax gluten free granola like cereal. It’s crunchy and nutty with subtle sweetness from honey or maple syrup. Unlike the overpriced bags you can find on supermarket shelves, this recipe makes a big batch that lasts us a couple of weeks. 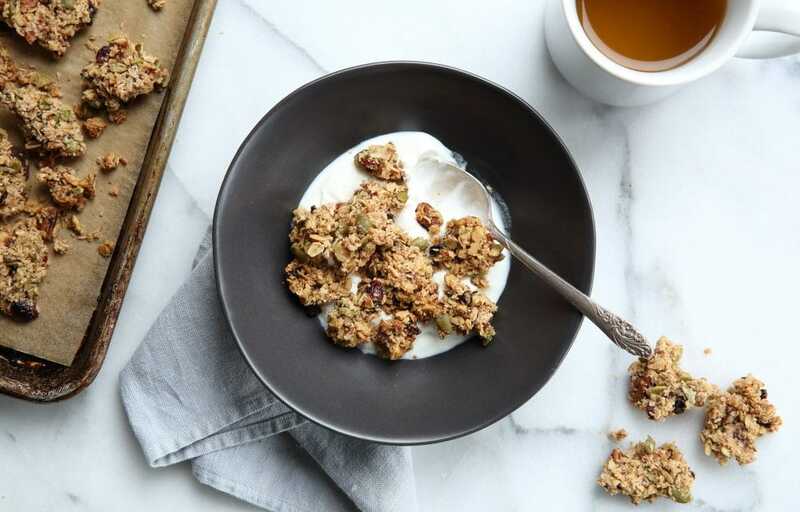 If you’re looking for something new and different, or for an oat- and grain-free alternative, you’ve got to try this toasted buckwheat and millet granola. The raw seeds are tossed with nut butter, honey and coconut, then baked until deliciously crisp. 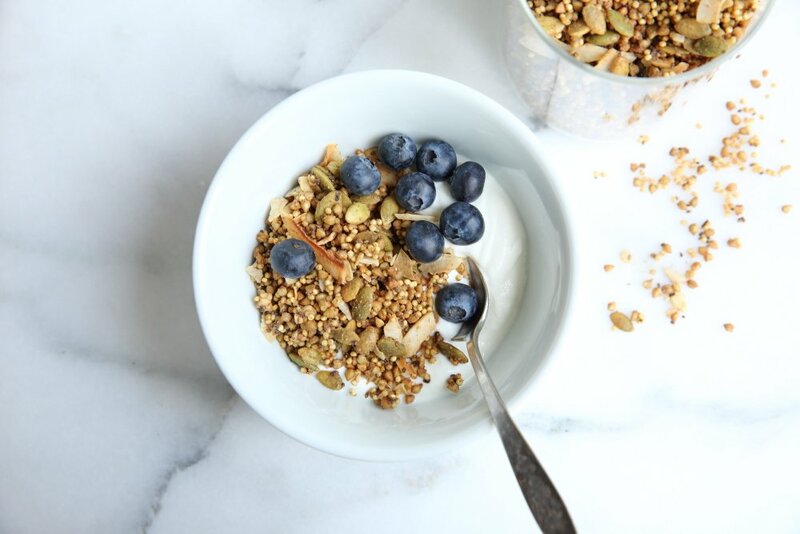 I especially love this granola over yogurt or on smoothie bowls, or even on salads and soups for crunch! The secret to getting big, crunchy granola clusters that hold up well in milk or as a snack is to use the food processor! 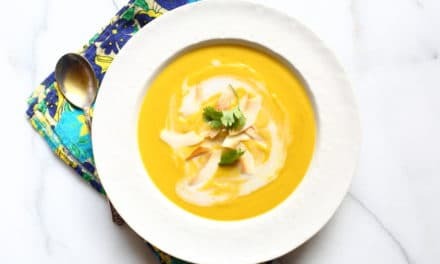 This recipe is adapted from a version in my first cookbook (The Food Processor Cookbook), and it’s a total game changer, especially if, like me, you’re a cluster lover! First you’ll process some of the rolled oats into a coarse flour, which will act as the binder, hugging all of the other ingredients together. Then you add the remaining ingredients and pulse to combine (check out my video above to see how it's done). 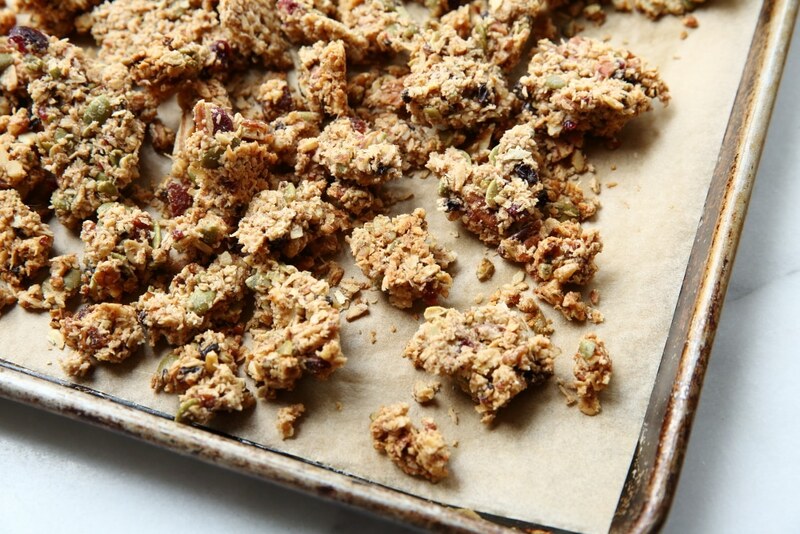 Don’t stir the granola when baking, and be sure to let it cool completely before breaking it into clusters. The clusters make for a delicious and healthy breakfast, snack or even dessert! Adapted from The Food Processor Family Cookbook (Sonoma Press 2016), by Nicki Sizemore. ½ cup coarsely chopped dried fruit, such as apricots, dates, cranberries, currants, cherries, etc. Preheat the oven to 300˚F. Line a large baking sheet with parchment paper. Put ½ cup of the rolled oats in the food processor, and process to a coarse flour. Add the remaining oats, along with the pecans, walnuts, pumpkin seeds, dried fruit, coconut, cinnamon and salt. Pulse until the nuts are coarsely chopped, about 5-6 pulses. In a small bowl, combine the maple syrup or honey, melted coconut oil and vanilla. Pour the syrup mixture over the ingredients in the food processor, and pulse until the mixture comes together and looks damp, about 8 pulses. Transfer the granola to the baking sheet. Using a rubber spatula, press it into a ½-inch thick rectangle, about 8x12-inches large. Bake 20 minutes. Rotate the pan 190 degrees and bake until lightly browned along the edges, golden on top, and firm to the touch, about 20-25 minutes longer. Cool the granola on the pan. Break it into clusters before serving. Do Ahead: The granola clusters can be stored in an airtight container at room temperature for up to 2 weeks. PreviousHealthy Sloppy Joes: even better than you remember! 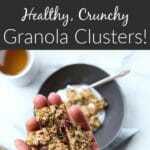 I have made many different granola recipes, but this one (love the clusters) is my new favorite. Thank you. Hooray! That makes me so happy to hear, Maria! 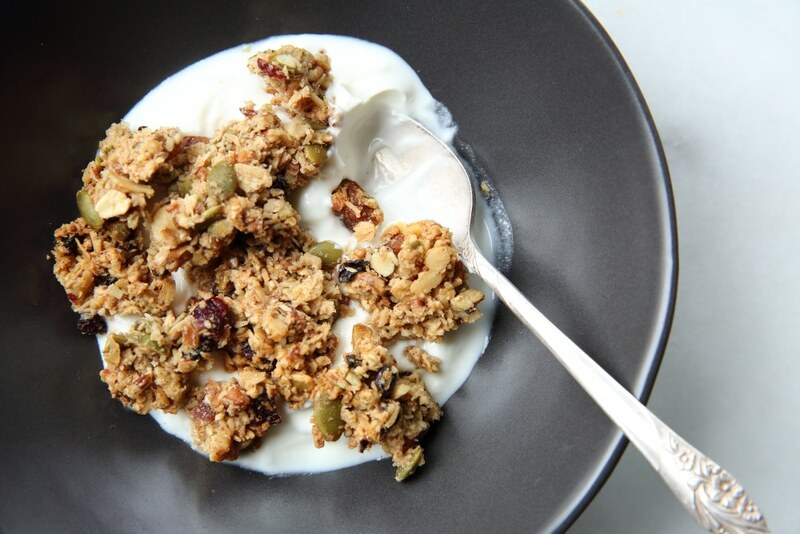 Yes, all I ever want is the chunks and so this is the most delicious granola ever! Yay!!! I’m so happy you like it, Karen! Hi Carolin, and welcome!! I’m so thrilled you like the granola. Thanks for your tips, and I hope to see you back here soon!